This drag and drop problem type has been replaced by a newer drag and drop problem type. The newer drag and drop problem type includes significant improvements and you should use it for any new course development. For more information about the replacement drag and drop problem type, see Drag and Drop Problem. This deprecated drag and drop problem type is not accessible for learners with some disabilities, and it does not work correctly on mobile phones and other devices that use touch screen interfaces. If you use this kind of problem, make sure that you include an alternative for learners who cannot access drag and drop problems, or leave these problems ungraded. For more information about creating accessible content, see Accessibility Best Practices for Developing Course Content. The Show Answer button does not work for drag and drop problems. By default, the Show Answer option is set to Never. If you change this option in the problem component, a Show Answer button appears in the LMS, but the button does not work. EdX offers provisional support for this problem type. In drag and drop problems, learners respond to a question by dragging text or objects to a specific location on an image. To create a simple drag and drop problem in which learners drag labels onto an image, you upload the image that you want learners to drag labels onto, and then create a problem component. On the Files & Uploads page, upload your image file. For more information about uploading files, see Adding Files to a Course. In the component editor, replace the example text with the text of your problem. In the <drag_and_drop_input> tag, replace https://studio.edx.org/c4x/edX/DemoX/asset/L9_buckets.png with the URL of your image file on the Files & Uploads page (for example, /static/Image.png). Repeat the previous step for all the labels that you want to use. Make sure that the id attribute is different for each <draggable> tag. Determine the coordinates and radius of the correct area on the image. Make sure the code contains the closing curly brace (}). To create the drag and drop problem that appears in the image above, you download two files from edX, upload these files to the Files & Uploads page, and then add the code for the problem to a problem component. To download both these files in a .zip archive, click http://files.edx.org/DragAndDropProblemFiles.zip. Upload the Allopurinol.gif and AllopurinolAnswer.gif files to the Files & Uploads page. In the component editor, replace the example code with the following code. <customresponse>: Indicates that the problem is a custom response problem. <drag_and_drop_input>: Indicates the custom response problem is a drag and drop problem. <draggable>: Specifies a single object that a learner will drag onto the base image. <target>: Specifies the location on the base image where a draggable must be dropped. img (required) Relative path to an image that will be the base image. All draggables can be dragged onto it. target_outline Specifies whether an outline (gray dashed line) should be drawn around targets (if they are specified). It can be either ‘true’ or ‘false’. If not specified, the targets do not have outlines. one_per_target Specify whether to allow more than one draggable to be placed onto a single target. It can be either ‘true’ or ‘false’. If not specified, the default value is ‘true’. no_labels (required) The default is false. In default behavior, if label is not set, label is obtained from id. If no_labels is true, labels are not automatically populated from id, and one cannot set labels and obtain only icons. Specifies a single draggable object in a drag and drop problem. A draggable is what the user must drag out of the slider and drop onto the base image. After a drag operation, if the center of the draggable is located outside the rectangular dimensions of the image, it will be returned to the slider. For the grader to work, each draggable must have a unique ID. id (required) Unique identifier of the draggable object. label (optional) Text label that the user sees. icon (optional) For draggables that are images, the relative path to the image file. can_reuse The default is false. If true, the same draggable can be used multiple times. Specifies the location on the base image where a learner must drop a draggable item. By design, if the center of a draggable lies within the target (i.e. in the rectangle defined by [[x, y], [x + w, y + h]], it is within the target. Otherwise, it is outside. If you specify at least one target, and a learner drops a draggable item on a location that is outside a target, the draggable item returns to the slider. If you don’t specify a target, a learner can drop a draggable item anywhere on the base image. id (required) Unique identifier of the target object. x X-coordinate on the base image where the top left corner of the target will be positioned. y Y-coordinate on the base image where the top left corner of the target will be positioned. w Width of the target, in pixels. h Height of the target, in pixels. Sometimes it is not enough to have targets only on the base image, and all of the draggables on these targets. If a complex problem exists where a draggable must become itself a target (or many targets), then the following extended syntax can be used. The attribute list in the tags above (draggable and target) is the same as for normal draggable and target tags. The only difference is when you will be specifying inner target position coordinates. Use the x and y attributes to set the offset of the inner target from the upper-left corner of the parent draggable (that contains the inner target). Currently there is a limitation to the level of nesting of targets. Even though you can pile up a large number of draggables on targets that themselves are on draggables, the drag and drop problem will be graded only if there is a maximum of two levels of targets. The first level are the base targets. They are attached to the base image. The second level are the targets defined on draggables. Another limitation is that the target bounds are not checked against other targets. You must make sure that there is no overlapping of targets. You should also ensure that targets on draggables are smaller than the actual parent draggable. Technically this is not necessary, but from the usability perspective it is desirable. You can have targets on draggables only in the case when there are base targets defined (base targets are attached to the base image). If you do not have base targets, then you can only have a single level of nesting (draggables on the base image). In this case the client side will be reporting (x,y) positions of each draggable on the base image. 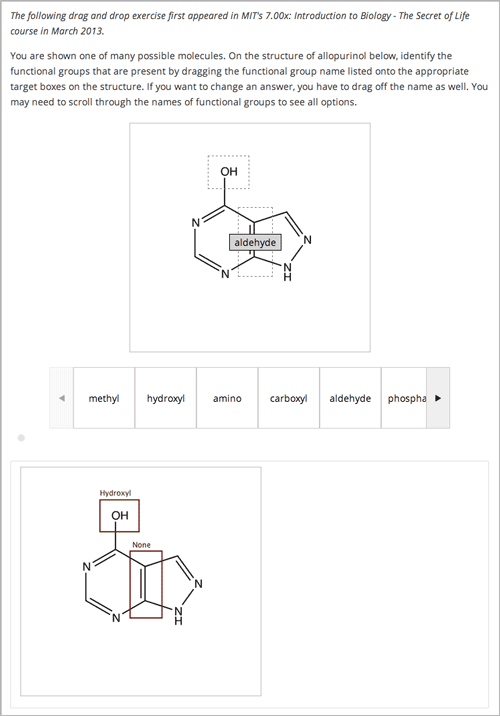 For specifying answers for targets on draggables, see Answer format for targets on draggables. There are two correct answer formats: short and long. “Draggables” is the list of draggable IDs. “Target” is the list of target IDs that draggables must be dragged to. Draggables in dicts inside the correct_answer list must not intersect. The values for rule follow. When there are no multiple draggables per targets (one_per_target=``true``), for the same number of draggables, anyof is equal to unordered_equal. If can_reuse=true, then you must use only the long form of the correct answer. As with the cases described above, an answer must provide precise positioning for each draggable (on which targets it must reside). In the case when a draggable must be placed on a target that itself is on a draggable, then the answer must contain the chain of target-draggable-target. Note that you must specify rules for all draggables, even if a draggable gets included in more than one chain. The learner’s answer and the correct answer are parsed to the same format. [t1] or [t1, t2] or [t1, t2, t2] etc..
For every group, at this step, draggables lists are equal. For every group, lists of targets are compared using the rule for that group. set() and +number are needed only for the case of reusable draggables. For other cases there are no equal draggables in list, so set() does nothing. This means that only draggable_1 can be dragged. If you do not use number, the draggables list will be set to [draggable_1, draggable_2].